More bad news for television: “Television exposure during infancy is associated with language delays and attentional problems,” according to Dimitri Christakis, director of the Center for Child Health, Behavior and Development at Seattle Children’s Research Institute. Of particular concern are homes in which the television is on all the time, which amounts to 30% of all households! In these situations, less interaction, critical for infant language development, occur because of the interference of the television. Analyses of the recordings revealed that each hour of additional television exposure was linked with a decrease of 770 words (7 percent) the child heard from an adult during the recording session. Hours of television were also associated with a decrease in the number and length of child vocalizations and the back and forth between the child and an adult (called a conversational turn). Child development experts say interaction with real people is key for language development (and social/emotional development too!). The French have banned TV for children under three-years-old, and the American Academy of Pediatrics recommends no television watching before the age of two. TV addicted kids are more likely to have poor diets as adults, and some don’t even know their own names! It’s crucial families turn off the tube and interact for the sake of their baby’s development. i dunno… i think it has to do with what and how much they watch. my 2 yo has a better vocabulary than children a year older and can read simple phonics books. we don’t watch tv. we watch dvds with no commercials and i try to steer clear of anything with the slightest sniff of potential licensing (though we do have old school sesame pre-disney). i also limit and promote other learning opportunities. moderation is the key for everything. Yes, moderation is key. I am just shocked that 30% of households always have the tv on. I’ve been in homes like that, and it drives me crazy. 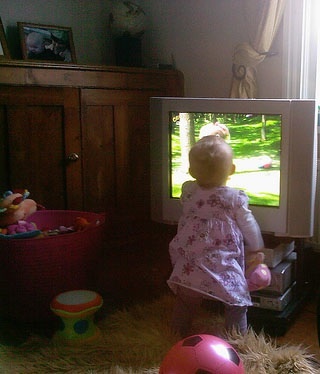 One of my sisters always has her TV on. I used to be that way, but not these days. Now if this applied to computers being on, I could be in trouble. Then again, I’m always talking to my kids, making time to play and so forth. I have a strict rule of “if the kids ask for a story to be read, they get it as soon as possible.” Some days that means a lot of interruptions, but that’s a good thing. “Television exposure during infancy is associated with language delays:” I speak 5 languages and my daughter takes after me. I do control television viewing at INFANCY (I suggest below 2 years old) and still do, not because of the effect it has on languages but on attention span especially for social interactions. now i know that a television can cause a delayed language development especially below 2 years, i have a daughter 1 year and 8 months which is very crazy watching television, even she’s very sleepy, when she heard a sound coming from tv, she stand up and watch it. Sometimes we have to distract her or i passed in front of her, or waved my hands , she pushed. she’s super crazy watching tv especialy concert like britney spears, she loved singing and dancing. she imitate it. very energetic.